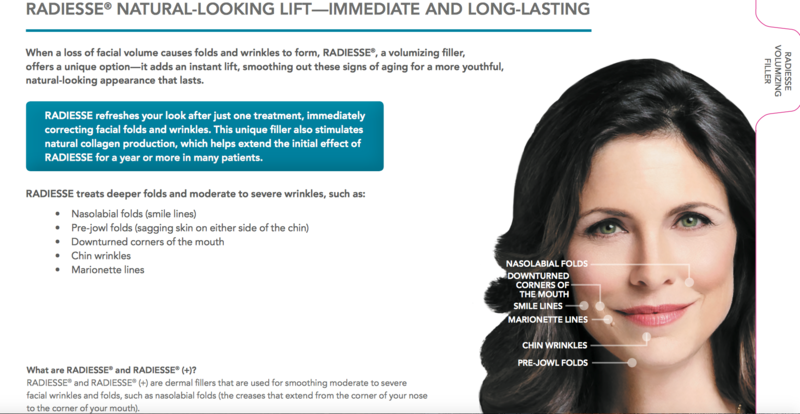 RADIESSE® and RADIESSE® (+) are dermal llers that are used for smoothing moderate to severe facial wrinkles and folds, such as nasolabial folds (the creases that extend from the corner of your nose to the corner of your mouth). RADIESSE® is also used for correcting volume loss in the back of the hands. Injection in the back of the hand may result in temporary dif culty performing activities. 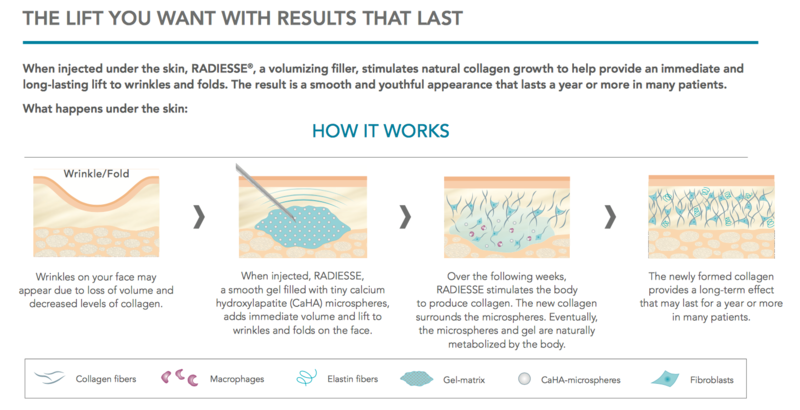 RADIESSE® may cause nodules, bumps or lumps in the back of the hand and can last up to 1 year. Tell your health care provider if you are taking blood thinners or medicines that can interfere with the clotting of blood, such as aspirin or warfarin. These medicines might make it more likely that you will experience bruising or bleeding at the injection site. Tell you health care provider if you have any diseases, injuries or disabilites of the hand, if you have a history forming large, raised scars or if you have had any other skin treatments such as skin peels. The most common adverse events when RADIESSE® is used in the hands include bruising, redness, swelling, pain, itching, nodules or bumps/lumps, dif culty performing activities, loss of sensation and other local side effects. The most common adverse events when RADIESSE® or RADIESSE® (+) is used in the face include bruising, redness, swelling, pain, itching and other local side effects. These are not all of the possible side effects with RADIESSE® or RADIESSE® (+). Tell your health care provider about any side effects that bother you or do not go away. Important: For full safety information, please visit www.Radiesse.com or call Merz Aesthetics Customer Service at 866-862-1211 RADIESSE® and RADIESSE® (+) are available by prescription only.